Fontenelle Dam is located on the Green River near La Barge, Wyoming and was originally built in 1964 to provide irrigation water and hydropower for a region of southwest Wyoming. 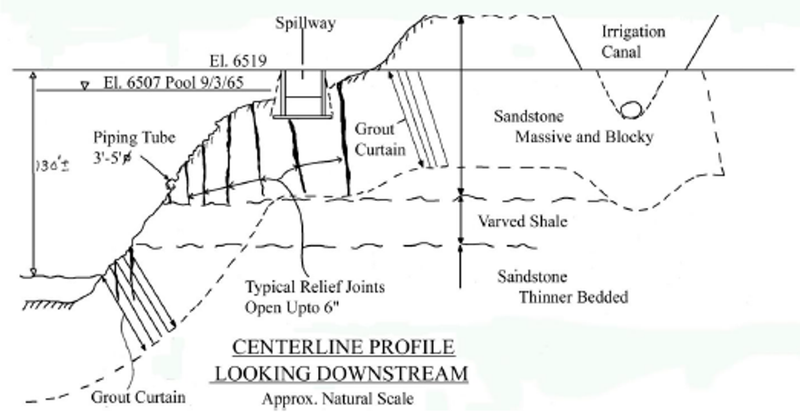 The earthfill embankment structure is 127 feet tall and consists of three zones of shale, sandstone, and limestone. Since its construction in 1964, a five-foot-thick blanket of riprap has been constructed on the dam’s upstream face to provide erosion protection. A concrete diaphragm was installed within the embankment in the 1980’s to protect it against internal erosion. 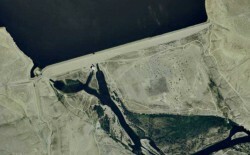 The outlet works system of the dam consists of a conduit through the embankment and two canals located on the left and right abutments. The dam’s primary spillway is a concrete chute located near its right abutment. 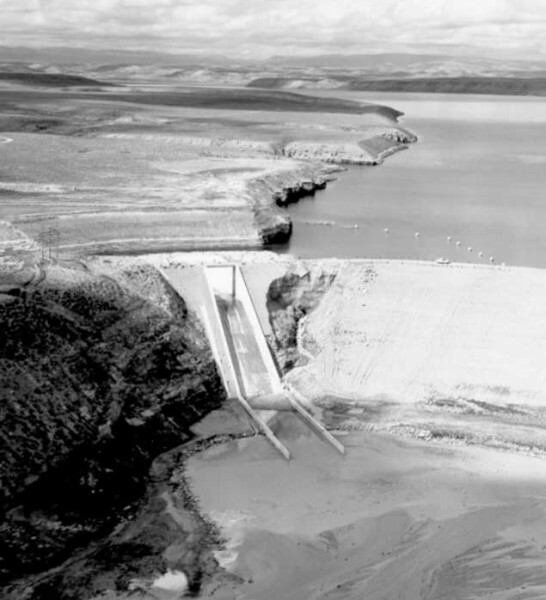 The original Fontenelle Dam began to leak during its first year of operation in 1964. In 1965, there was record winter snowfall and high spring runoff. Due to damage in the outlet works stilling basin, flows were limited through the outlet works at this time and the spillway passed the majority of the spring runoff event. The reservoir quickly rose five feet above the spillway crest and only two feet below the design elevation. 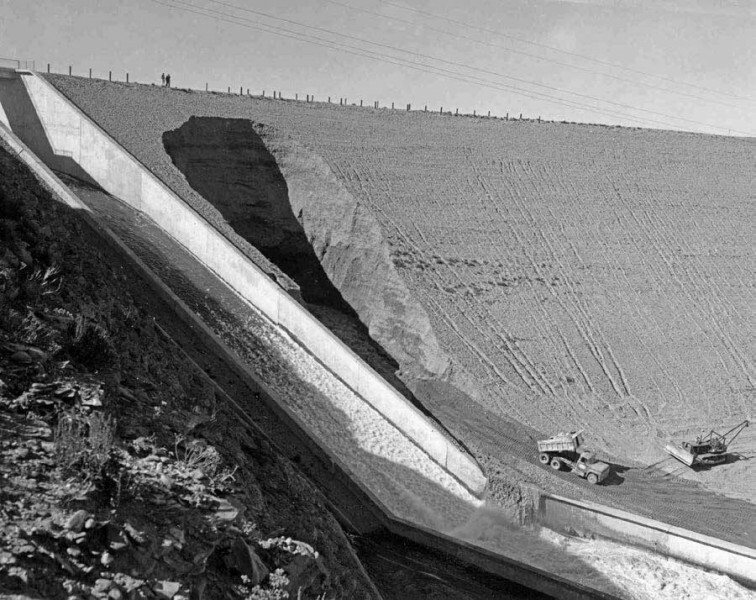 On the afternoon of September 3, 1965, the project construction engineer noticed seepage exiting from about halfway up the embankment near the spillway on the right abutment. The seepage quickly reached one cfs and continued to increase. 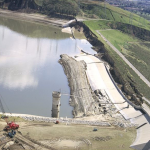 By 10:00 p.m., the leak was estimated to be five to six cfs and the seepage had eroded a rapidly growing cavity in the downstream face of the dam. Reclamation’s Chief Engineer and other engineers arrived at the site the following morning. By that time, the seepage was measured at fifteen to twenty cfs and the cone-shaped erosion cavity was 60 feet deep, 80 feet across and over 200 feet in length. Over the next 8 days, the engineers waged a dramatic battle to save the dam. 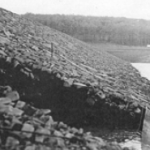 Fractured sandstone that provided foundation for the right abutment of Fontenelle Dam. The main outlet works were opened to their maximum capacity. Canal outlets on both abutments were also opened causing extensive erosion. Extra equipment was borrowed from the county. 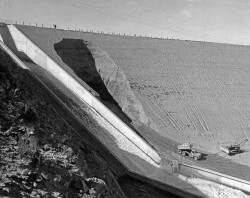 A stockpile of rock from dam construction was dumped from the crest of the dam to slow the enlargement of the cavity. Unfortunately, the falling rock broke loose embankment soil as it fell creating a rock and earthen berm in the bottom of the cavity. This effectively dammed the leak which would stop for several minutes and then burst forth – greatly worrying the engineers. Dumping of rock from the crest ceased on the 3rd day. On the 4th day of the incident, in front of a small crowd, a 15-foot by 20-foot section of the dam crest collapsed and left a large sinkhole in the dam. Water was leaking from the abutment rock in the bottom of the thirty foot deep hole. The sinkhole was also filled with dumped rock. The downstream town of Green River was on edge for a week and the story made national headlines. The reservoir was lowered about four feet per day. On the ninth day of the incident, the reservoir had been lowered a total of twenty-nine feet, and Reclamation issued a press release stating that the incident had passed. View of Fontenelle Dam’s downstream face adjacent to the spillway chute on September 4, 1965. The collapsed embankment and evidence of piping can be seen (Courtesy of Mark E. Baker). 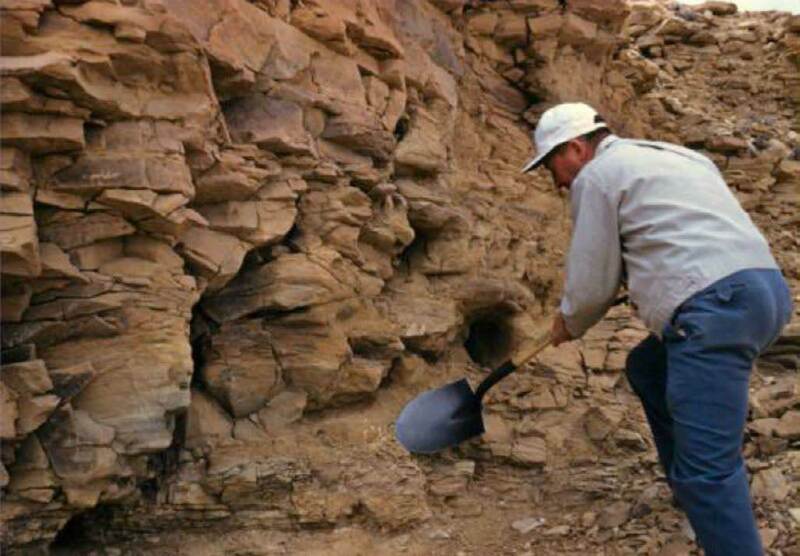 Following the incident, there was an extensive forensic investigation that included geologic exploration and geotechnical analyses of the foundation and embankment. The cause of failure was found to be unprotected relief joints in the foundation cutoff excavation that allowed seepage of reservoir water under pressure to erode embankment soils into the open fractures. A lack of filter protection at the embankment cutoff contact with the fractured foundation allowed seepage erosion and piping to occur downstream of the grout curtain cap. 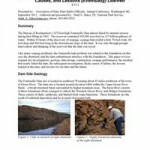 The continuing erosion resulted in eventual collapse of a portion of the downstream slope and a cavity to develop and enlarge. Had the engineers not dumped rock from the crest, the cavity would have likely reached the reservoir causing the dam to breach. Had the reservoir not been lowered as rapidly as it was, the dam would have likely failed through continuing internal erosion. The US Army Corps of Engineers reviewed the incident. 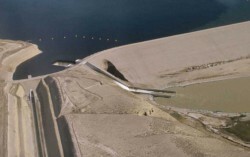 Following the failure of Teton Dam (only 160 miles from Fontenelle Dam) in 1976, the General Accounting Office wrote that the lessons of the Fontenelle Dam incident were not incorporated into Reclamation’s design and construction practices. 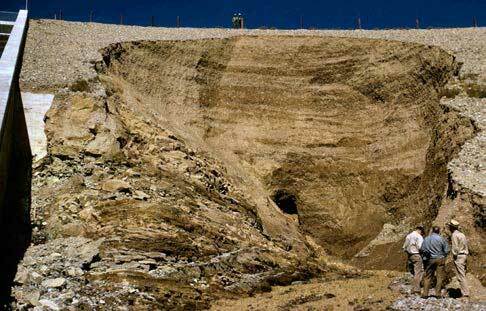 Teton Dam also failed through erosion of embankment materials into unprotected fracturing in the foundation. (1) Baker, M. (2011). The Fontenelle Dam Incident: The Investigation, Likely Causes, and Lessons (Eventually) Learned. ASDSO Annual Conference. Washington, D.C.: Association of State Dam Safety Officials. (2) Gobla, M. (2013). Fontenelle Dam Incident, Wyoming, USA. AEG Shlemon Specialty Conference: Dam Failures and Incidents. Denver: Association of Environmental and Engineering Geologists. (3) Snorteland, N. (2009). Fontenelle Dam, Ririe Dam, and Teton Dam: An Examination of the Influence of Organizational Culture on Decision-Making. ASDSO Annual Conference. Hollywood: Association of State Dam Safety Officials. (4) General Accounting Office, CED-77-85. (1977). Actions Needed to Increase the Safety of Dams Built By the Bureau of Reclamation and the Corps of Engineers. 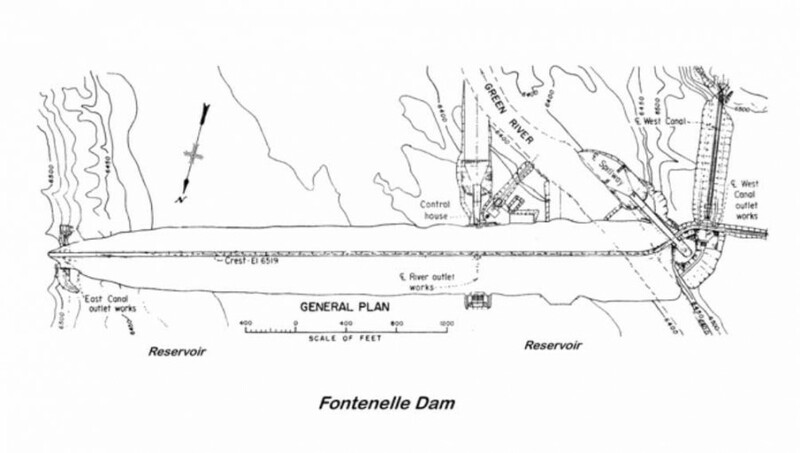 Plan view drawing of Fontenelle Dam and its appurtenances (Photo source: Michael J. Gobla, 2013 AEG Shlemon Specialty Conference). Profile of Fontenelle Dam’s right abutment and details looking downstream (Photo source: Mark E. Baker, 2011 ASDSO Annual Conference). 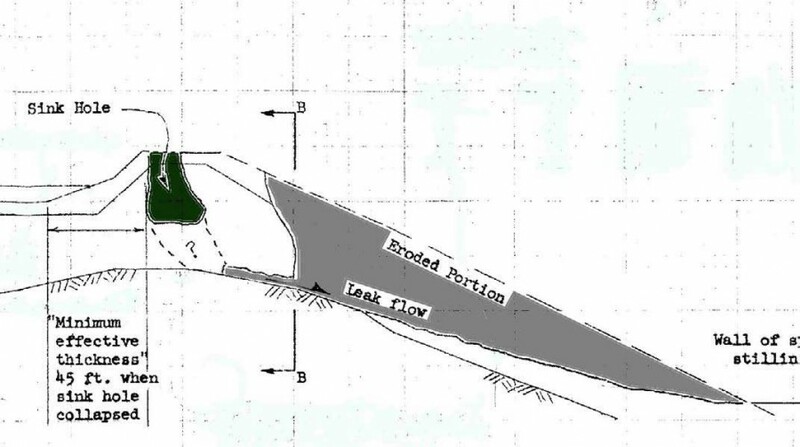 Elevation view of typical Fontenelle Dam embankment section (Photo source: Mark E. Baker, 2011 ASDSO Annual Conference). activated. 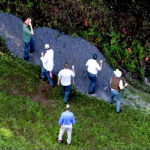 Collapsed embankment visible adjacent to the spillway chute (Photo source: Michael J. Gobla, 2013 AEG Shlemon Specialty Conference). Collapsed embankment during attempts to prevent the Fontenelle Dam from breaching in 1965 (Photo source: Mark E. Baker). Aerial view of Fontenelle Dam and eroded cavity adjacent to the spillway chute after emergency action (Photo source: Nathan J. Snorteland, 2013 AEG Shlemon Specialty Conference). 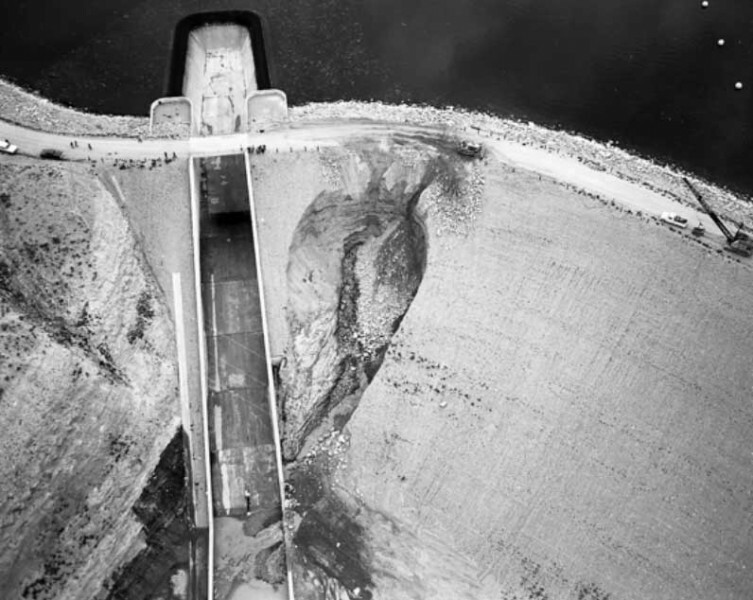 Aerial view of the spillway chute and eroded cavity of Fontenelle Dam during emergency action (Photo source: Michael J. Gobla, 2013 AEG Shlemon Specialty Conference). 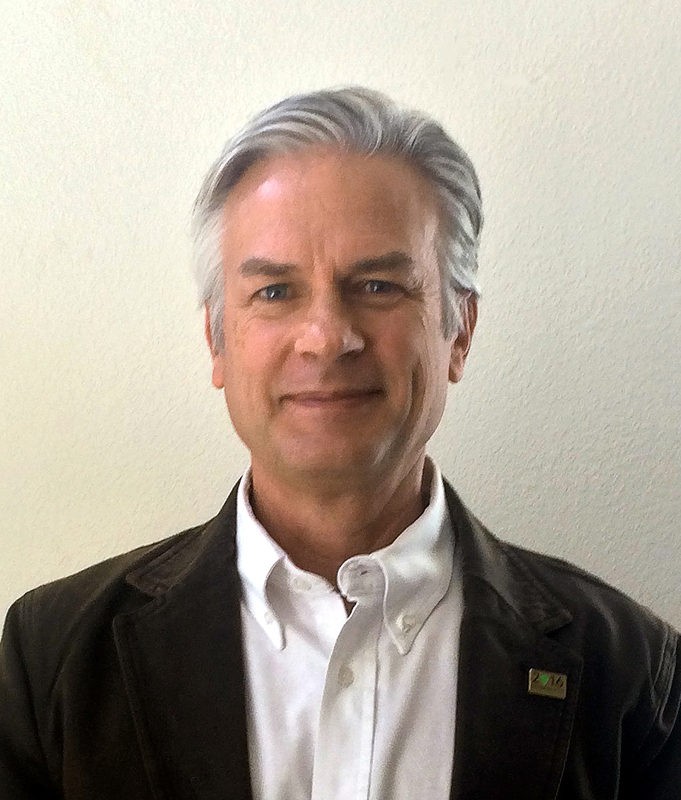 (Photo source: Mark E. Baker). Aerial view of properly functioning Fontenelle Dam (Photo source: Nathan J. Snorteland, 2013 AEG Shlemon Specialty Conference). 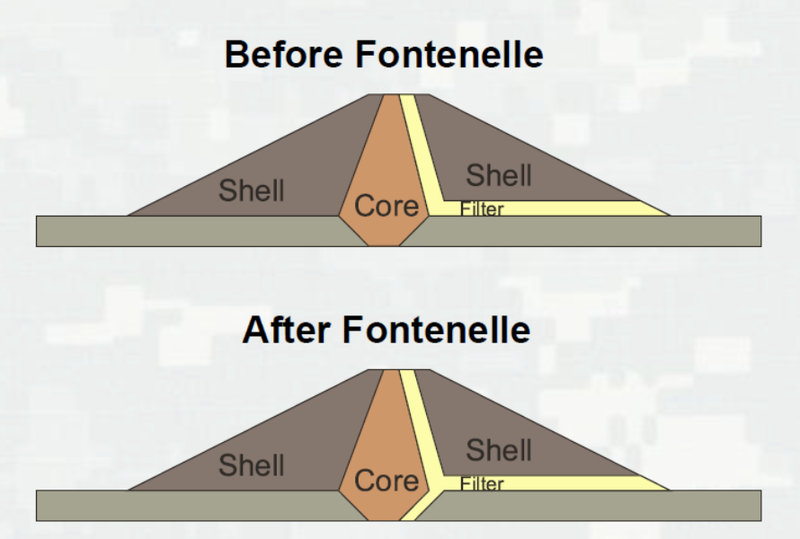 Diagram showing adjustments made to standard filter and drain systems for embankment dams following the Fontenelle Dam incident (Photo source: Nathan J. Snorteland, 2013 AEG Shlemon Specialty Conference). Video footage of leak observed on September 3, 1965. Video courtesy of Mark E. Baker. Footage of bulldozer filling cavity with rock during emergency efforts to prevent complete failure of Fontenelle Dam. Video courtesy of Doris DeGraw. Pan view of cavity in Fontenelle Dam during emergency efforts to end the internal erosion that was occurring adjacent to the spillway. Video courtesy of Mark E. Baker. External independent peer review of designs and decisions is an effective means of providing quality assurance and reducing the risk associated with design oversights and deficiencies. High and significant hazard embankment dams should have internal filter and seepage collection systems. In emergency situations, lowering the reservoir can be an effective means of risk reduction. Poor compaction, steep rock abutments, and other foundation discontinuities at embankment dams can lead to differential settlement, cracking, and failure by internal erosion. Treatment of fractured foundation rock for embankment dams is important to prevent internal erosion of embankment material that is in contact with the foundation. Warning time and rapid response is critical to saving lives during a dam failure. ASDSO. 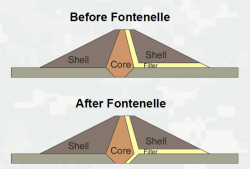 Failure Categories and Case Histories: Fontenelle and Teton. Dam Failures and Lessons Learned Seminar. Denver: Federal Emergency Management Agency. Chief Engineer. (1968). 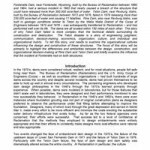 Article on Fontenelle for Reclamation Era, Memorandum. General Accounting Office, CED-77-85. (1977). Actions Needed to Increase the Safety of Dams Built By the Bureau of Reclamation and the Corps of Engineers.